Cast: Kurt Russell, Rosario Dawson, Zoe Bell, Mary Elizabeth Winstead. Story: Stuntman hassles women on the road. Running Time: 1hr 54 minutes. Death Proof my arse. Uprooted from its natural home and left to wither on its own like a Christmas tree, nothing could've stopped this one dying a death at the box office. Death Proof is Quentin Tarantino's half of the "Grind House" double feature that played back-to-back in American cinemas. The idea didn't go down too well over there, so we get this one and the upcoming Planet Terror as separate releases. Big mistake. The idea kind of worked with the A feature first (Planet Terror), followed by some mock trailers that were genuinely amusing and then this (short!) B movie that you could let drift over you. As a standalone feature, lengthened by nearly half an hour for its individual release, it has absolutely no chance whatsoever. Send for the priest, the death proof movie needs the last rites. Kurt Russell stars as Stuntman Mike, who drives a "death proof" car - meaning that it's reinforced so heavily for his stunt work that it can't be killed. Turns out Mike's a bit of a nutter and likes harassing groups of women out on the road. These bits are moderately watchable, featuring as they do some classic muscle car metal in their natural habitat - dirt-lined freeways - and the stunts are all done for real, but they're hardly Dukes of Hazzard or even Vanishing Point quality, however I have to give them extra marks for Zoe Bell, who is both one of the stars and the stuntwoman, so when you see her writhing about on the bonnet of the speeding car, that's really Zoe, doing her day job. A great deal of effort has been expended to make everything look like an old crackly drive-in movie - which is all very clever and nostalgic if you experienced them at the time, but why on earth you'd want a modern movie to deliberately re-enact this poor quality is a complete mystery to me. If I wanted to watch the 1966 World Cup Final I wouldn't put it on a six inch black-and-white telly that needed half an hour to warm up while it slowly cooked me, I'd put it on the plasma and get the best quality I could. Wouldn't you? Tarantino's success in achieving what he set out to - create a B movie in the style of 1970s flea-pit cinemas - is his own undoing. You can't emulate a crappy B movie and expect it to be anything more than a crappy B movie. If it came on TV you'd turn over after ten minutes. Don't waste your money. Testosterone Satisfaction Rating: 3/5 - some passable car stunts and brutal violence. To enjoy this film you should: have some fond drive-in memories to rekindle. 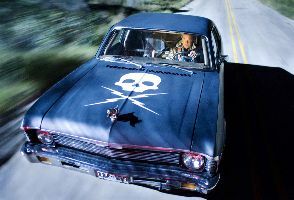 Death Proof was released in the UK on 21st September 2007. The comments printed here are not necessarily the views of Forwardcharm! But hey, the car chases are great, Kurt Russell hams it up well and the girls are cute.